Have it been awhile since your last teeth cleaning? No problem. Our local dentist is always more than happy to answer any questions you might have about your upcoming appointment. A teeth cleaning will not only protect your oral health, but help you save money in the long run. Continue reading to learn what you can expect during your next dentist appointment with us. The dental hygienist will use a high-powered toothbrush to clean your teeth, so don’t be alarmed by the loud whirring sound. 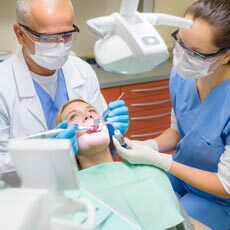 If you have dental anxiety, it’s important to remember that a dental cleaning should never hurt. Dr. Kelly M. Giera DDS and her team are dedicated to helping you maintain a beautiful healthy smile by offering preventive dentistry services. To schedule an appointment with our Troy dentist, call Mosaic Dental at (248) 528-2270.